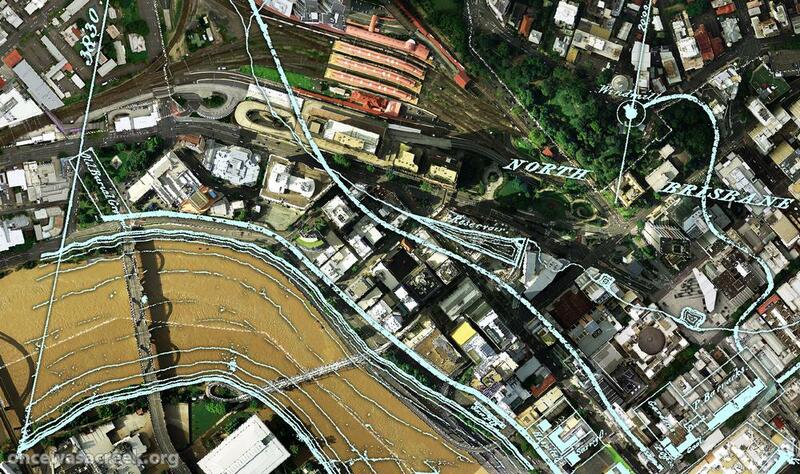 Milton: Brisbane’s western frontier | There once was a creek . . . 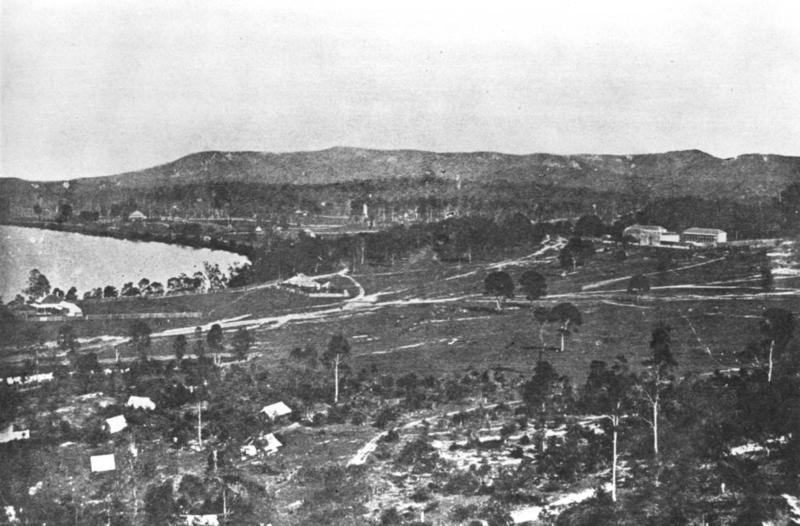 The transformation of the Western Creek catchment began with the westward expansion of Brisbane into the area that became known as Milton. 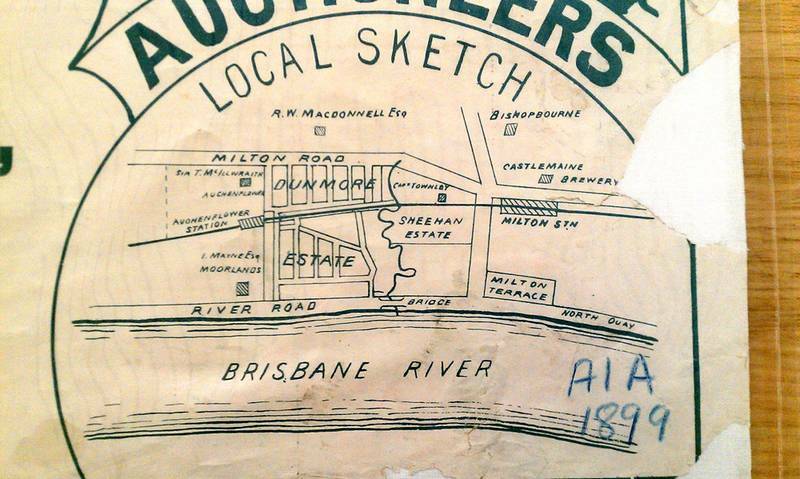 On this page we take a trip back to these early days of Brisbane to see how this development unfolded. Along the way, we learn about some of the first residents of Milton, and take a stickybeak at their homes as well. Milton occupies a special place in the history of Brisbane. For it was Milton, and not the present-day CBD, that was first discovered as a potential site for a settlement along the Brisbane River. The person who made the discovery was John Oxley, the Surveyor-General of New South Wales between 1812 and the mid-1820s. Oxley first explored the River in December 1823, naming it after Sir Thomas Brisbane, the Governor of New South Wales. 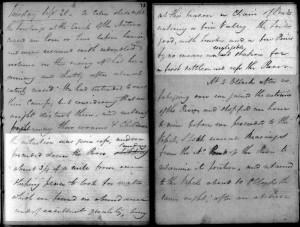 In September 1824 he returned, under instructions to find a site for a new penal settlement that would manage Sydney’s most hardened and recalcitrant criminals. At the same time, a temporary settlement was established at Redcliffe Point. 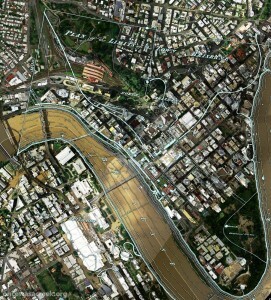 Eligible or not, Western Creek was ultimately passed over as the site of the new settlement. The colony was established instead on the peninsular immediately downstream, where the CDB is today. The final choice was probably guided by the military instincts of Lieutenant Henry Miller, the first commandant at Moreton Bay. 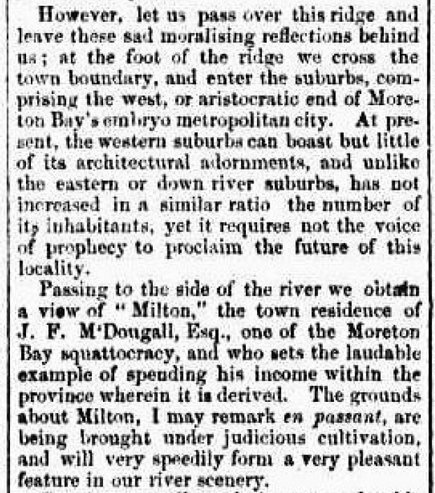 While Oxley emphasised the fresh water and fertile land available along Western Creek, Miller opted for the protection that the peninsular afforded in the event of an attack.4 (Given the purpose of the site, I wonder if the peninsular was chosen to guard against escape as much as invasion.) 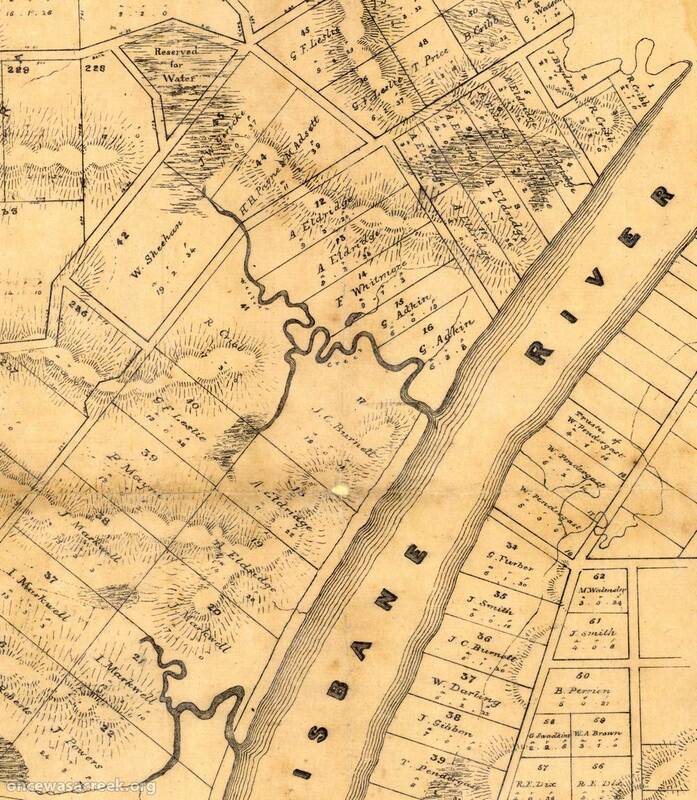 Whether due to foresight or just good fortune, Miller’s choice also protected the settlement from the river itself. Had the colony been established at Western Creek, the convicts might have swum away in the first flood. 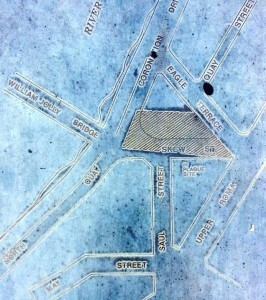 A plan of the town limits from 1843 overlaid on an aerial photo (Dept of Natural Resources and Mines) from January 2011. Within a year of Oxley’s 1824 visit, the settlement at Redcliffe was moved permanently to the peninsular on the river. It quickly gained a reputation as one of the most brutal penal colonies in the country. Upwards of 2,000 convicts were sent there over its 14 years of operation.5 After it closed in June 1839, the convicts departed, the surveyors moved in, and Brisbane was on its way to becoming a free settlement. 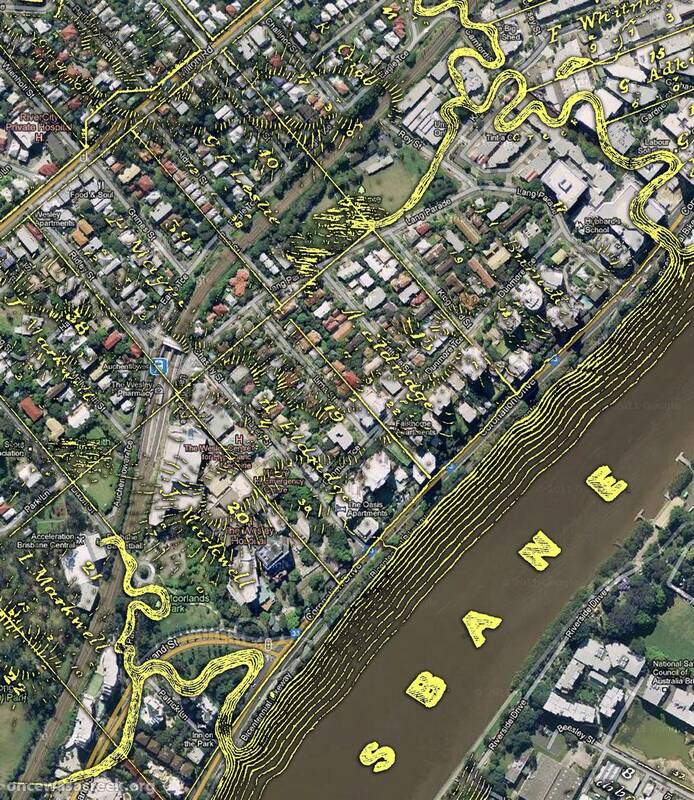 When the first land sales were held in 1842, the town of Brisbane was still very much restricted to the peninsular where the CBD is today.6 The limits of the town can be seen on the map to the right, which shows a plan from 1843 overlaid on a recent aerial photograph. 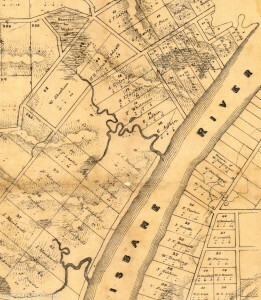 As well as some of the early buildings and streets, this map shows the reservoir that was built on the creek running from Spring Hill to Creek Street. 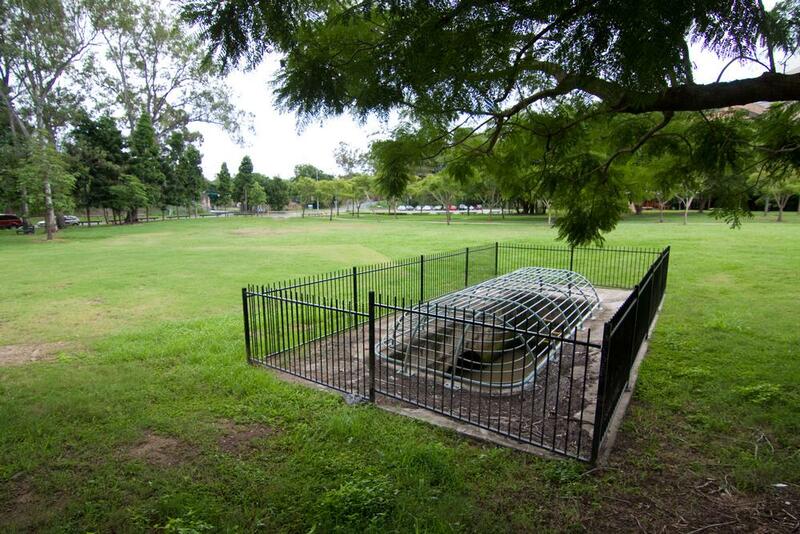 This was Brisbane’s first water supply, and remained in use until the Enoggera Reservoir was built in 1864. 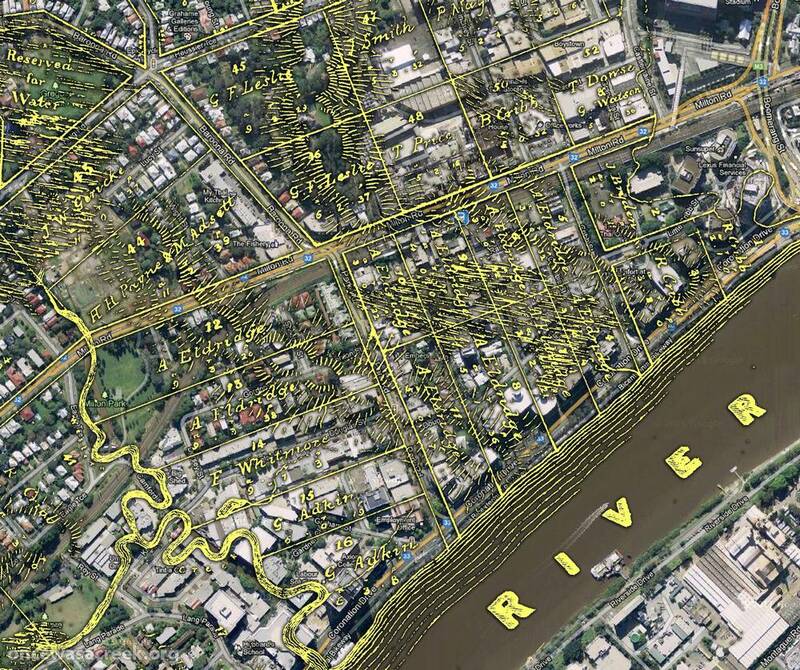 The first areas outside the town limits to be surveyed and sold were Fortitude Valley, South Brisbane and Kangaroo Point. For a while at least, all was quiet on the western front.7 The natural western boundary of the town was Boundary Creek, which met the river near the Go Between Bridge and flowed through where Suncorp Stadium is today. 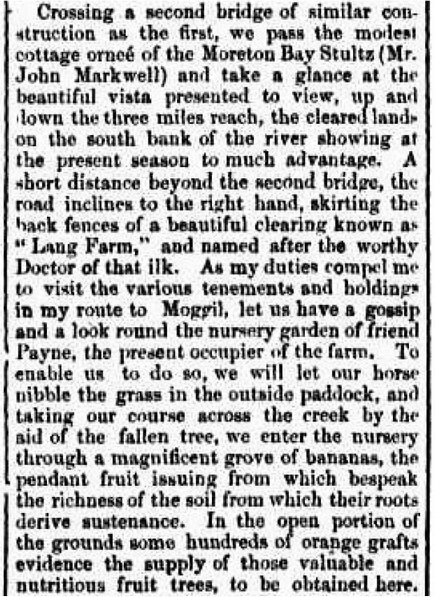 Some land beyond this creek (Portions 1 to 15 of the Parish of Enoggera, bounded by Western Creek and Milton Road) had been surveyed by Robert Dixon in 1839.8 But this land was not auctioned off until August 1851, after a more detailed survey in 1850 by James Warner.9 The first buyers included Robert Cribb — a merchant and businessman, and one of many ‘high quality’ immigrants brought to the colony by John Dunmore Lang — and Ambrose Eldridge, a pharmacist and aspiring agriculturalist from Sydney. 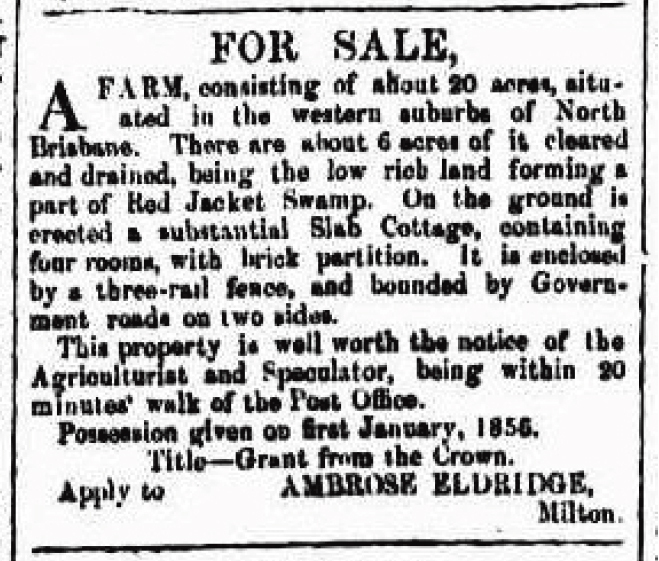 Robert Cribb also bought land near Toowong Creek in 1852, where he established ‘Lang Farm’. The Milton area, as depicted on a map from 1859 as depicted on a map from 1859 (Queensland State Archives, Item ID620656), overlaid on Google Maps. The Auchenflower area, as depicted on a map from 1859 as depicted on a map from 1859 (Queensland State Archives, Item ID620656), overlaid on Google Maps. The site of one of Brisbane’s earliest cemeteries, as depicted on a memorial plaque at E. E. McCormick Place. Our tour begins on a rather sombre note, at the fence of what was probably Brisbane’s first cemetery. The site is shown in the map to the right, which is engraved on a memorial plaque at E. E. McCormick Place, a small park on Upper Roma Street.13 It can also be seen marked as ‘Old burial ground’ in this detail of the 1843 overlay shown earlier. From such a starting point, you might think that the mood of the journey could only get brighter. Our guide is referring to the jail on Petrie Terrace, which was completed in 1860 and used until about 1883 when it was converted into a police barracks.15 The view would have resembled that in the photograph below, which was taken in 1862, presumably from Wickham Terrace. The jail is on the top of the hill at the middle-right of the picture. The cemetery must be somewhere in the centre of the picture, but is hard to make out in this version of the photograph. Looking further into the distance, in the middle-left of the photo, we can also see a white triangular roof. We will come to this building shortly. But first, we must move on from the depressing outskirts of the town. Though taken some 15 years later than the time of our tour, the photograph below shows a view similar to what our guide must have seen (perhaps with a few more houses and a few less trees). The fenceline in the foreground probably aligns with Cribb Street, and the paddocks beyond it are those of Milton Farm. This land is now the Kings Row Office Park. The two-story, double-chimney building just to the right of the centre of the picture is McDougall’s residence, Milton House. Western Creek is just out of view, being over the ridge on which Milton House house stands. However, just beyond the creek we can see another distinctive residence — one that was barely completed when our guide passed through. 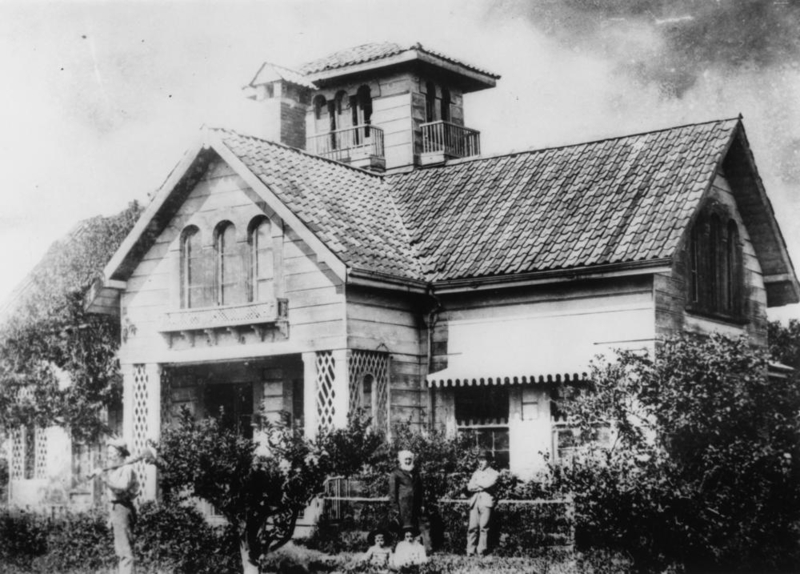 The eccentric ‘Dunmore’ was built close to the intersection of Coronation Drive and Lang Parade, land that is now occupied by an office building. 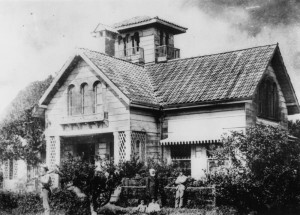 The name of the house was a nod to John Dunmore Lang, whose efforts to import upstanding immigrants from the motherland had brought Robert Cribb to Brisbane in 1849. Cribb’s Dunmore Estate spanned all the way back to Milton Road and along the river from Western Creek to what is now Chasely Street.18 The whole estate was subdivided and offered at auction in 1899. The house was pulled down, and its cedar used to build ‘Dunmore House’, which still stands on Milton Road, about half way up the hill from Frew Park.19 As the panorama below shows, much of the orignal Dunmore Estate area remained as paddocks until as late as 1910. Dunmore Terrace is visible in the foreground, dipping down to meet Chasely Street on the right. Highrise apartments now obscure most of this view. In the far-right of the picture, we can see part of the Moorlands Estate, which encompassed what is now the Wesley Hospital and Moorlands Park, as well as the area spanning back to Milton Road. This land was originally owned by George Edmonstone, a butcher and businessman, but in the mid-late 1850s came into the hands of John Markwell, who married Edmonstone’s daughter.20 Through the low-lying parts of the estate (such as Moorlands Park and the Auchenflower Croquet Club) flowed Langsville Creek, which our tour guide is about to cross before following the road through present-day Toowong to yet another landmark named after John Lang. There is still a long, long way to go to get to Moggill. Thankfully though, we’ve seen all we need to see. So as our tour guide continues on his merry way, we’ll look for a ripe banana or two to see us home. What became of the estates? 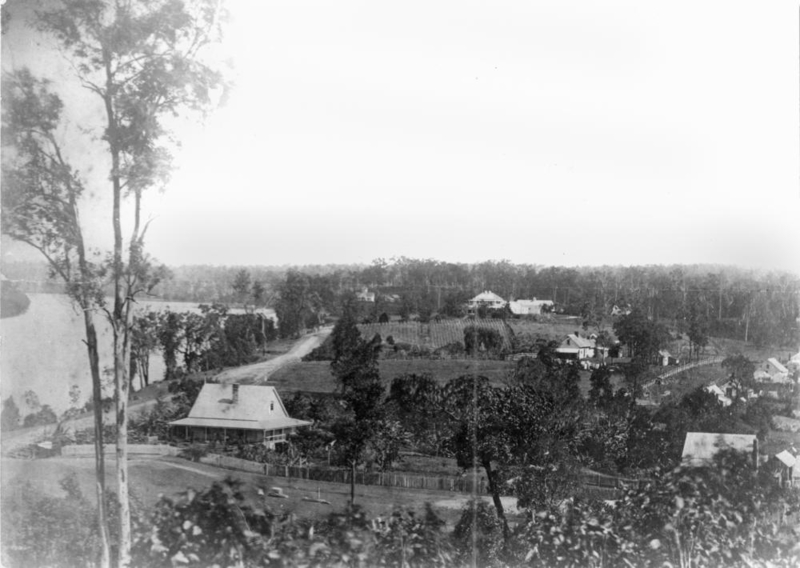 Eventually, these grand estates were subdivided into suburban lots so that they could become places of residence and commerce for the growing population of Brisbane. Much of the Moorlands estate followed a somewhat different path, passing first to the Mayne Family, then the University of Queensland, and finally the Uniting Church, who built the Wesley Hospital.21 The story of these subdivisions will be told on another page. Please be patient while I write it! Pingback: Once upon a time in the west | There once was a creek . . .
Angus, I meant to tell you that I know a descendant of Lt Miller who was the first commandant. 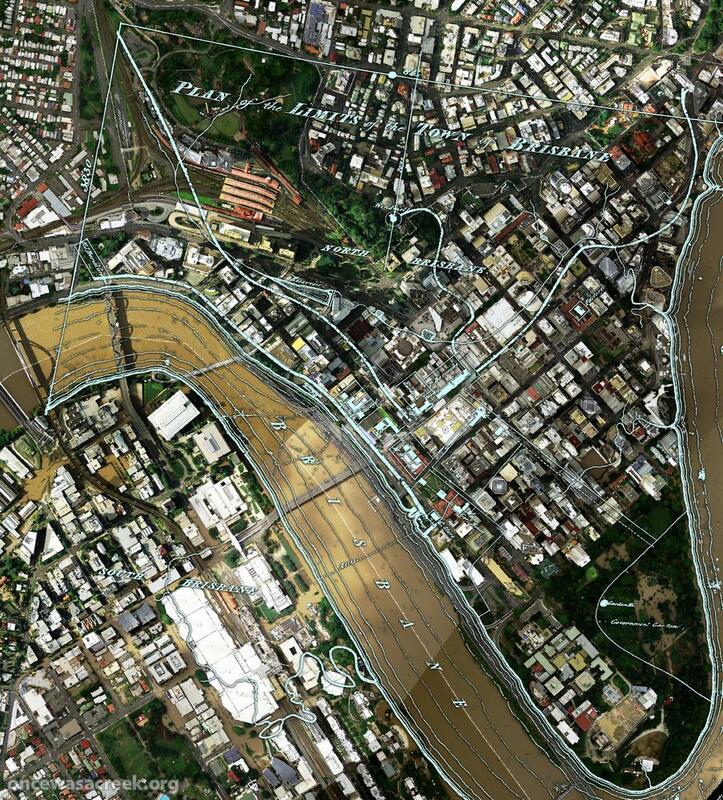 But I have not explored with him whether he actually has any documents or artifacts associated with Brisbane. Maybe after March 27 I could follow up. Although he is awfully decrepit and I may have left my interest too late. Angus – great post, excellent research and map work. 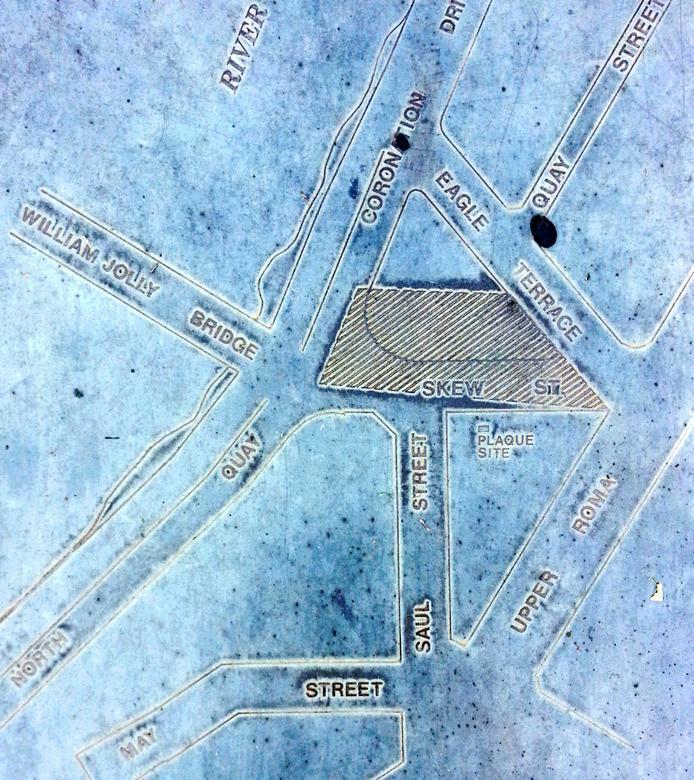 As for my Auchenflower neighborhood I’ve come across some inconsistencies between the old land ownership maps and the Deed of Grant for the portions north of Milton Road, as detailed in my latest post on Simon Munro. The maps appear to be semi-reliable for reasons that I have yet to explain. The research goes on. Thanks for the correction re the year of Cribb’s arrival. Not sure where I got 1851 from. When I’m in the mood I will come up with a less specific reference to the names of the two houses called Dunmore. I get the feeling that it’s a hair that doesn’t need splitting! Great to hear from a descendent of one of Milton’s pioneers. 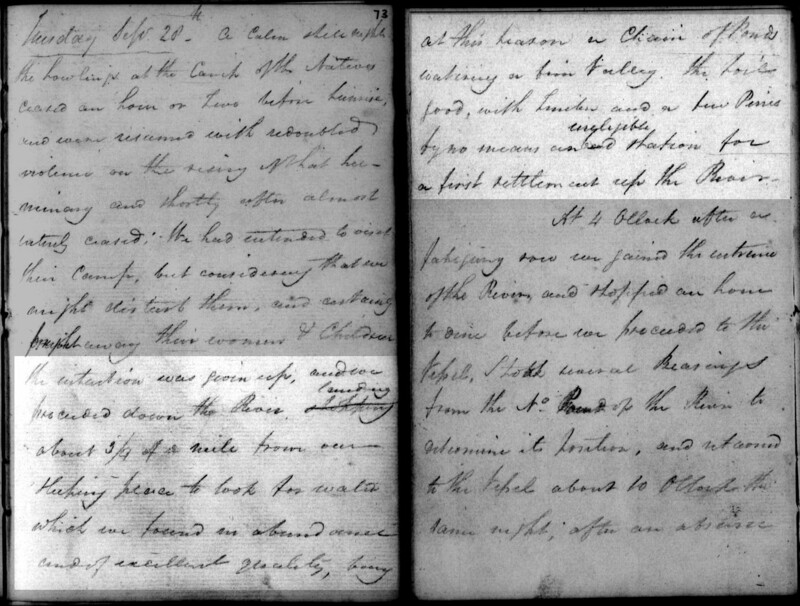 Angus you have researched this area so well – you may have answers to some of my questions….my great grandfather John George Cribb lived in Cribb Street and I have a photo taken during the 1893 flood that shows his house above flood waters. It must have been on a hill that has since been levelled because I cant see how it was not flooded. Any thoughts? Believe it or not, I was checking out that hill just yesterday! It is still there, although it is disguised somewhat by the office building, carpark and other structures that have been built into it. I didn’t stop to think about whether it would still be clear of the 1893 flood, or if it has been lowered as you suggest. But make no mistake — the hill is still there. I was checking out the site because I have just completed some research into the history of the Coronation Drive Office Park, when includes the site of Fairholme. I hope to be posting the results of that research in a few weeks. Hi Trev. Unfortunately I don’t recall reading anything about Park Place. If I stumble across something in the future, I’ll be sure to let you know. Interesting that Park Place would have been close to Park Road. I’ve never gotten around to researching the origin of that street name! Frederick Shaw was my great great grandfather. A few months ago I went trolling through Park Road looking for where this house might have been. 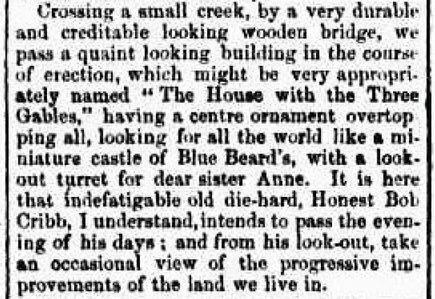 I had a couple of maps printed off the internet, along with a number of articles from Trove describing the house and its views etc. I concluded, and I could be wrong but I think it was somewhere between Douglas street and Gordon Street. 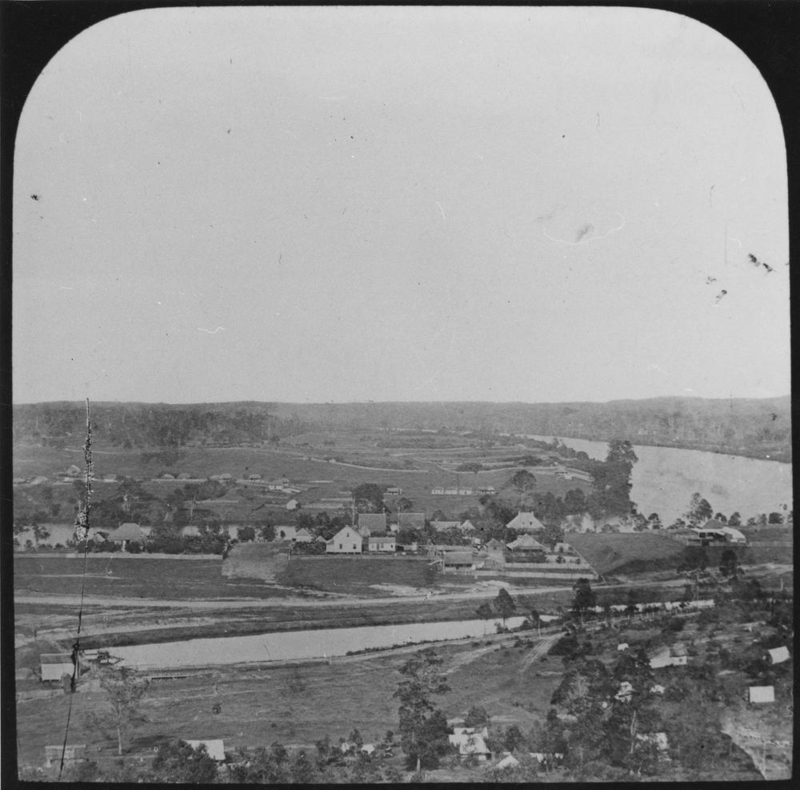 One trove article described the looking out the front towards the city, with the river on the right hand side. The held a number of social gatherings there before Matilda died in 1886. Another article about Milton House suggested, about half way down Park Road. Would love to find a photo of it one day. Such a warm feeling to read some history and geography of an area where I grew up in my teens.Thankyou to you patient folk for rsearching it all. Would love any info from someone who’s ancestors came from Taringa.We lived at 22 Princess st Taringa from 1956 to approx. 1964. It was a beautiful old Queenslander just up from the station.Very old,as still had gas light pipes on the walls.Thanking you in anticipation.